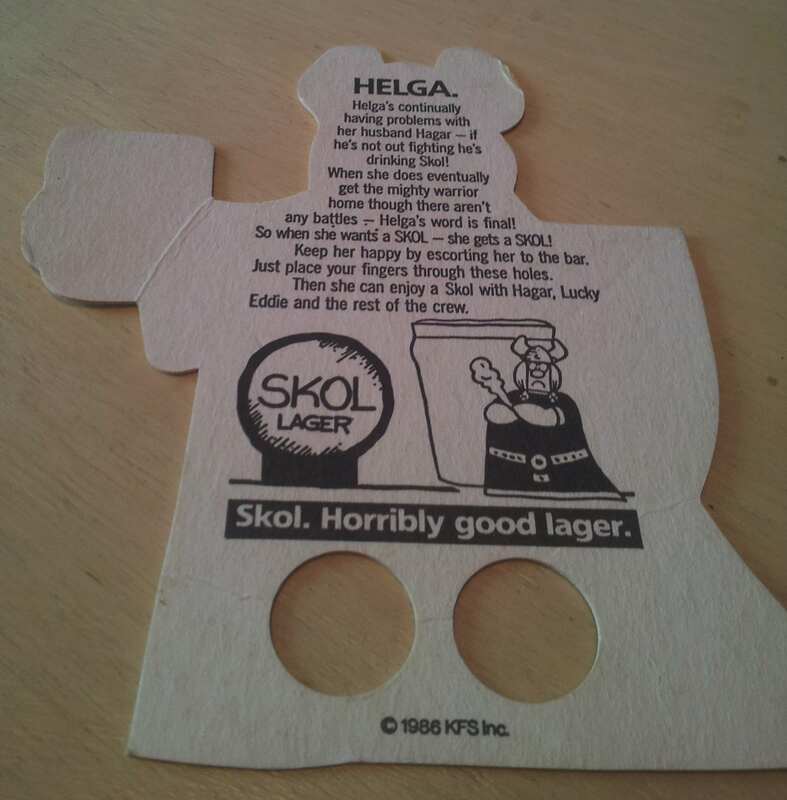 Behind Helga’s back… it’s all about her getting a beer. I’ve just been having a rant over on my other blog about the way images of women (usually sexualised ones) are used to sell all kinds of stuff. It came out of finding a bunch of leaflets and other papery items in a forgotten folder which included Helga (pictured above). Unlike the item that made me rant, I actually kind of like this – even though the beer it is promoting is not my thing – so I thought I’d post it for your interest and perhaps enjoyment. 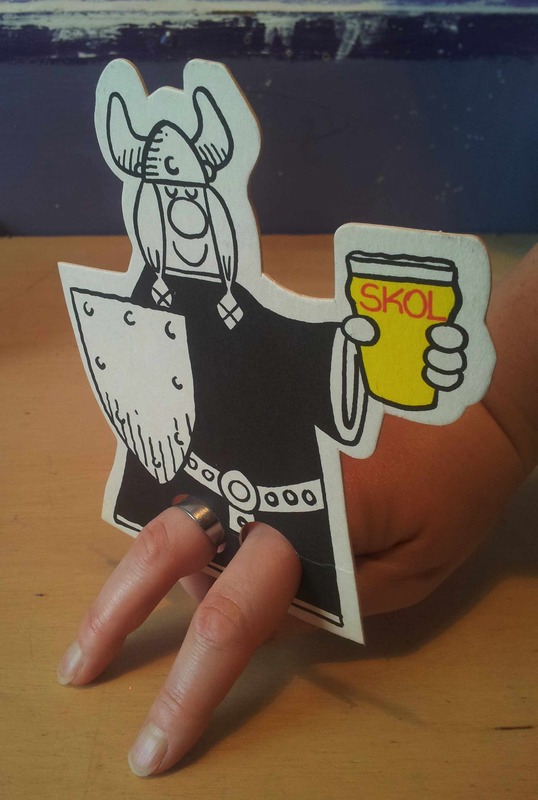 As Helga (and Hagar) are cartoon Vikings it also means there’s not too much to worry about in the way the female form has been represented. To sum up I’m not offended by this. It seems rather cool. A strong female wants her beer and gets her beer – without any argument. Or am I missing something? If I remember rightly, I think Helga generally faired better than Hagar in most of their comics… But as I can’t for the life of me remember where I read them so I may be wrong! I was hoping someone would chip in with something about the comics. I’m not sure I ever read them but I somehow know who the characters are. I think Helga is pretty PC compared to the ‘lager lovelies’ that Tennent’s used to feature on their cans! In the early days these women were sometimes paired with recipes in a ‘Housewives choice’ series. So, you had such classics as: Amanda (savoury sausages), Cynthia (spaghetti casserole) and Morag (soused fish). The first lady on a can though was Venetia Stevenson, the image on Sweetheart Stout to this day. She later married an Everly brother and her daughter dated Axl Rose, leading to her being the subject of ‘Sweet Child of Mine’. I think Helga is pretty PC compared to the ‘lager lovelies’ that Tennent’s used to feature on their cans. In the early days they experimented with a ‘housewives choice’ series of recipes. So, you had such classics as: Amanda (savoury sausages), Cynthia (spaghetti casserole) and Morag (soused fish). The earliest lady on a can that I know of though was Venetia Stevenson, whose image still graces cans of Sweetheart Stout to this day. She later married an Everly brother and her daughter married Axl Rose, becoming the subject of Sweet Child o’ Mine. “What’s the connection between Guns & Roses and Sweetheart Stout” would be a cool trivia question. Thanks Robert – and for all the interesting info. ‘Love it! Ah, Lisa. A woman after my own heart. How do you think *I* came by Helga?! I can see beermats, and the theft thereof, might be something I have to revisit in the future. Personally I think the 80s were the start of the realisation by big brewing corporations that the business was stagnant. Pubs were the domain of men and they needed more revenue so the logical target was women. Ale was still predominantly thought of as a man’s drink so the “ladies” were targeted by the breweries but all ads were for lager. However, if you remember as I do, it was also the decade of such drinks as Two Dogs ( tasted like it too! ), Hooch and Cherry B to get us girls into the pubs with our menfolk. There were also films like Working Girl and 9 to 5 out at that time, go getting women over coming male dominated industries to lead the way with their power suits and big hair. It was the decade of business realising that women were starting to regain control of the purse strings and they wanted to cash in on that. And how about Pub 80s? Dreadful revamping (read ruining) of perfectly good traditional pubs in the misguided belief that drinkers would prefer to be at a disco?! Give me Helga any day of the week. But not mainstream lager. I can’t see nothing wrong. A woman (weak or strong, no matter) wants a beer and she goes and gets it. The way it must be for both women and men. The beermats are really nice. I have also developed this kleptomaniacal habit of “stealing” coasters from pubs, and some of them treat sexuality in a funny way, with no harm. I can remember a good one by Shag Lager, for instance. What annoys most is this increasing trend to brew “beer for women”. Let everyone decide which beer fits best according to their taste. I actually designed these dripmats way back in 86. I was just looking them up online to try to get a set on eBay when I saw your comment. Glad you like the Helga one.